The 1903 is a large ring, 1898 style, Mauser, but with a 1893 style small shank barrel. According to Olson, 200,000 of these were made by Mauser in Oberndorf between 1903 and 1905. When these were converted from their original 7.65mm to 7.92mm (this is often called an 03/38), the receiver was slightly notched to easily allow loading of the slightly longer rounds. The bolt and magazine of the 1903 is also shorter than an actual 8mm model 98. This is an intermediate length action and the bolt and magazine are 0.2 inches shorter than a standard length 98 action. The receiver face is, coincidentally, 0.2 longer than a 98. Other intermediates include the M24 by FN, the Yugoslavian Models 47, 48 and several South American contract rifles. This rifle would have had a pistol grip stock which is a change from the straight stock of the 1893. The rear receiver bridge will also have a "high hump". The hump is there to handle the special clip and is also seen on the 1909 Peruvian. The Turks converted some Mausers that appear to be 1903's except for the missing hump. They even added a small piece to the receiver that supports their unique clips. These similar rifles are possibly South American contract rifles that were never delivered. I love that slim elegant stock. IMHO that is what a rifle stock should be. 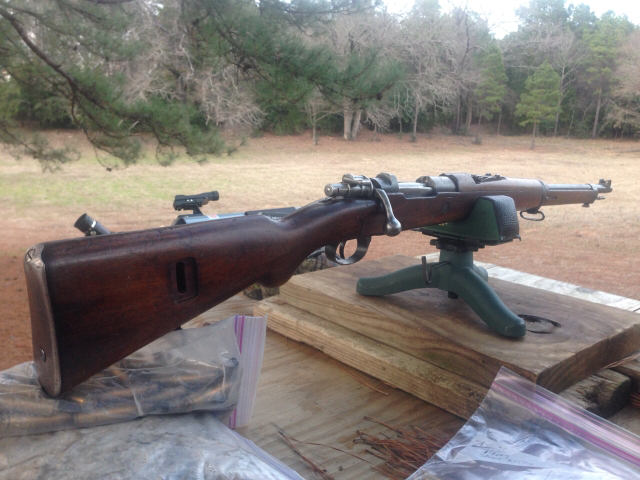 The one I have was converted to 8mm Mauser in 1935 and has the large billboard style markings on the receiver. It has an original sling and is an accurate shooter. I have a 1903 and I agree with you, its one of my favourite mausers. They are great shooters but imo they feel "right" when you bring them up to your shoulder. As you said the stock design contributes to this. The 1903 short rifle is my favorite Turk - not many of these recorded. I've got one short Turk that I've never fired. Perhaps it is time. I loved it when the Turks were cheap. Those were great days.